A new aurone, named (Z)-4,5-methylenedioxy-6-hydroxybenzene-2[(2′,3′,4′-trimethoxy)-2-methyl-2(4-methyl-3-penten-1-yl)-2H-1-benzopyran-5-yl)methylene]-3-benzofuranon (1), and nine known aurones (2–10) were isolated from Sophora japonica L. for the first time. Compounds 1–10 were evaluated for their neuroprotective activities against 6-OHDA-induced cell death in SH-SY5Y cells. 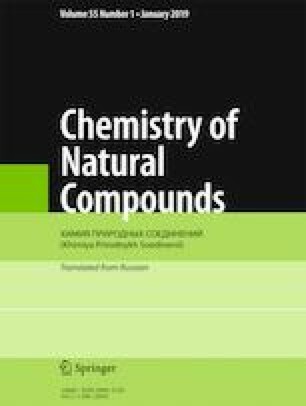 Compounds 1, 3, 8, and 10 exhibited significant neuroprotective activities with IC50 values in the range of 2.89–6.02 μM. Published in Khimiya Prirodnykh Soedinenii, No. 2, March–April, 2019, pp. 228–231. This work was supported by the Key Scientific Research Project of Colleges and Universities in Henan Province (No. 19A350006), the National Natural Science Foundation of China (No. 81803843), and the Standard Revision Research Project of National Pharmacopoeia Committee (No. 2018Z090). We are grateful to the Department of Instrumental Analysis of Nayang Normal University and Jiangxi University of Traditional Chinese Medicine for measurements of UV, IR, NMR, and MS.